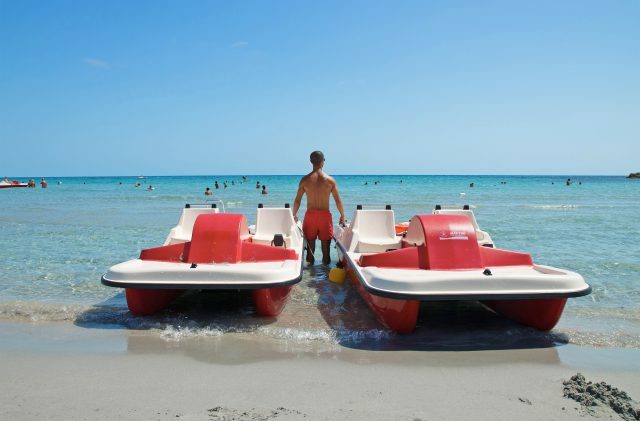 Spending enjoyable moments with friends and family is easy with the hire of pedalos at Cala Ginepro. A pedalo is a great way to have fun and make the most of the sea – in a simple pedal-powered boat, the unique surroundings of Cala Ginepro will amaze you with their breathtaking beauty. You can dive to your heart’s content in the crystal-clear waters of Cala Ginepro, or soak up some rays surrounded by the blues and greens of the untainted natural paradise that is the Gulf of Orosei. Once you’ve got the hang of how they work, pedal boats are easy to use: the passengers seated in the front seats start pedalling, which powers the mechanism that enables the boat to move forward in the water. You then use a lever to steer. Pedalo trips at Cala Ginepro are ideal for all the family – fun for young children, entertaining for older children and relaxing for adults. The rental service is open from 1 June to 30 September. You can choose the hourly rate, or opt instead for a half day or a full day (from 8.30am to 7pm). The assistants are available to provide you all the information you may require on hiring pedal boats. We look forward to seeing you on Cala Ginepro beach!